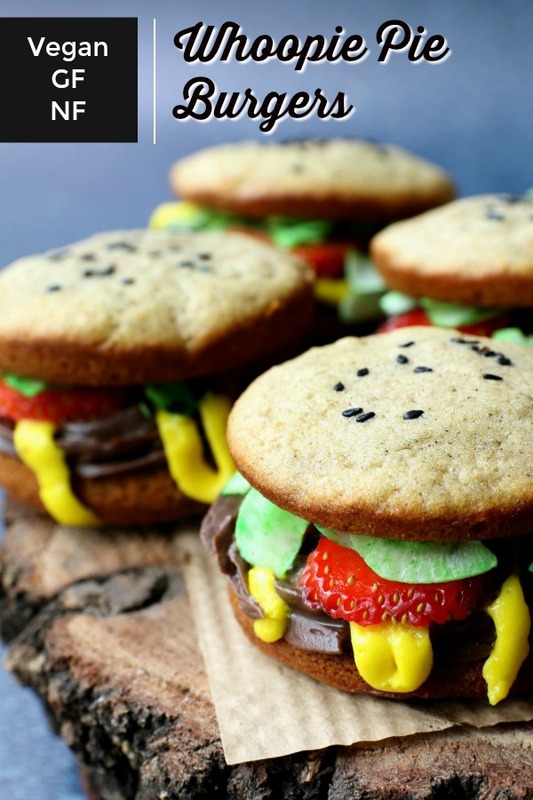 That’s not your usual burger…it’s a whoopie pie disguised as a burger. Even better! 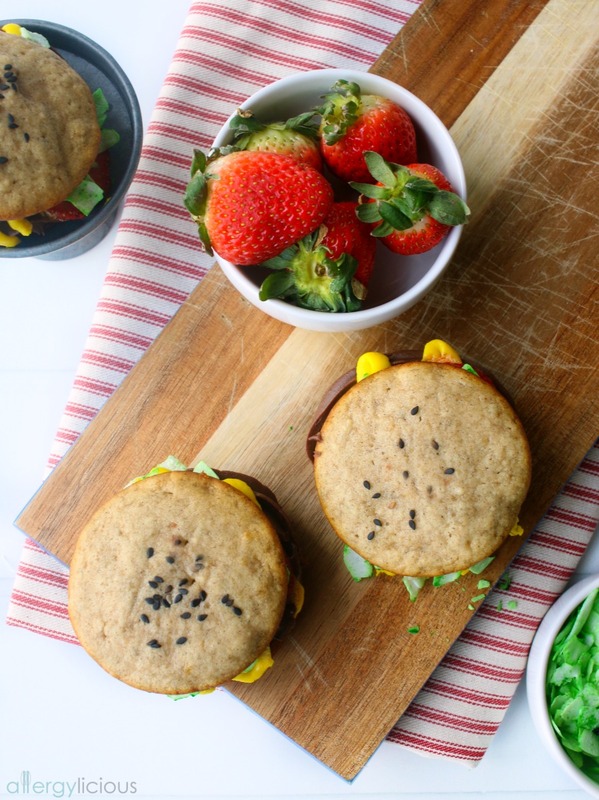 While I love my vegan burgers , I simply cannot resist dessert so why not have a little fun and make a dessert that looks like a burger? 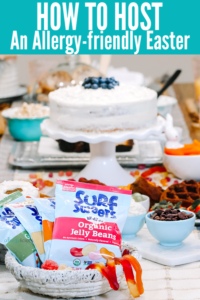 It’s a perfect treat to throw together for this weekend’s big Super Bowl game but think beyond this weekend. How great would these be, serving to your guests at your next sports themed birthday party, Summer BBQ or Guys Night? You’ll score points with this one! So let’s start with the basics…the cookie. 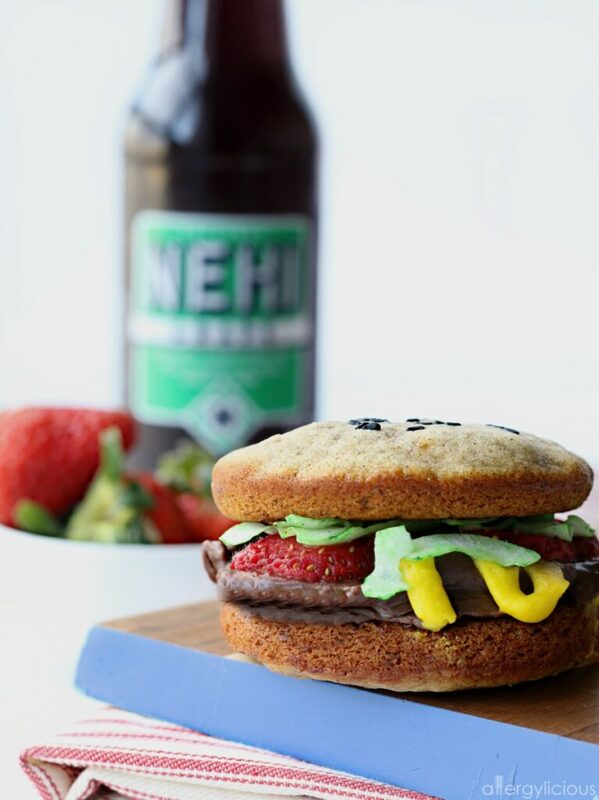 Obviously you need the perfect “bun” to hold your “burger” and our vanilla version will not disappoint! It’s springy, and cakey and delicious on its own. For the sake of making it a little more “bun-like”, I added a sprinkling of black sesame seeds on the top, but feel free to substitute with chia seeds or mini chocolate chips if you have a sesame allergy. And when you’re in the mood for a whoopie pie and not a burger version, this vanilla cookie cake will be a fabulous compliment to any filling you might choose. Strawberry, Chocolate, Peppermint, SunButter……so many other options. Here in Oklahoma, we call it “fix-ins”. Basically whatever you add to your burger! So let’s layer it up with the most delicious “ingredients”. The Burger – a decadent chocolate frosting swirled on the top of your whoopie pie bun. Homemade chocolate vegan buttercream is what we used and pairs so nicely with the lightness of this cake, but if you’re short on time, grab your favorite “safe” store-bought brand and use that instead. I just don’t like uber-sweet, so we usually just make our own. The Mustard- simply drizzle yellow “mustard” across that patty like you normally would. When you make your own homemade frosting, simply take out 1/4 of it and set aside to use for your mustard. Simply add a little yellow coloring, mix in and you’ve got you’re next condiment…just grab your small round decorating tip to make it happen. The Ketchup- no tomatoes here….just freshly sliced strawberries to add a pop of color and layer of sweetness. The Lettuce – no burger is complete without lettuce and we get ours with some green colored coconut chips. 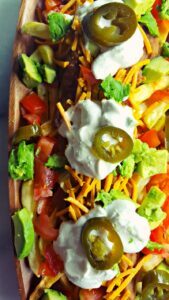 Make these this weekend and share with friends and family while you’re watching the Super Bowl and all those hilarious commercials! Speaking of commercials, real quick…..do you have a favorite Super Bowl commercial you remember from years past? 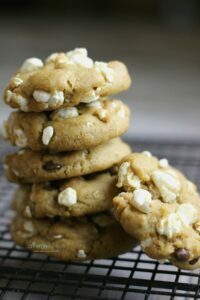 If you give these a try, let me know by leaving a comment and rating the recipe! It’s super helpful and while you’re at it, take a picture and tag it #allergylicious on Instagram so we all can see! 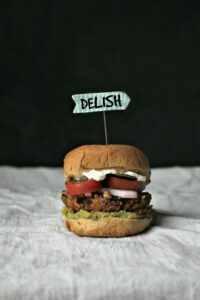 I just love seeing what you come up with and what changes you may have made based on your own food restrictions. 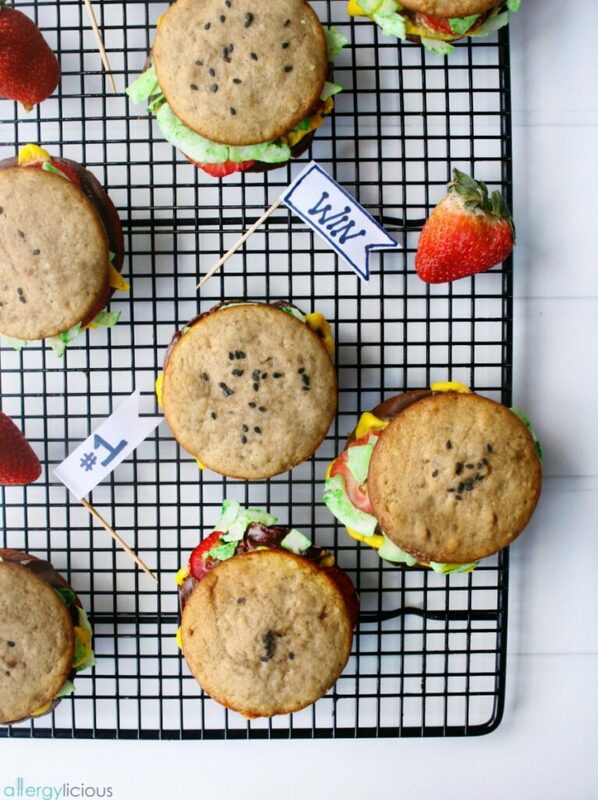 Have fun watching the game and cheering on your favorite team & eating these yummy Whoopie Pie Burgers. Soft and cakey, vanilla cookies, sandwiched together with a decadent chocolate “patty” then layered with strawberries (ketchup) and coconut (lettuce) for the most fun and delicious Game Day Treat. 1 Cup Coconut chips or shreds, mixed with 1-2 drops of green food coloring. Preheat the oven to 350°F and spray your whoopie pie pans lightly with cooking spray. If you don’t have whoopie pie pans, simply line two cookie sheets with parchment paper. Sift together flour, baking soda, cinnamon and salt into a small bowl and set aside. In a large mixing bowl, beat together the butter, shortening and sugar until light and fluffy. Approximately 3-4 minutes. Add the mashed banana, vanilla and let it run another 2 minutes before adding flour mixture. Alternate flour mixture and milk until combined. Drop 1 small ice cream scoop (2 TB) of batter into each cavity OR drop onto the lined cookie sheet, leaving 2″ between each. 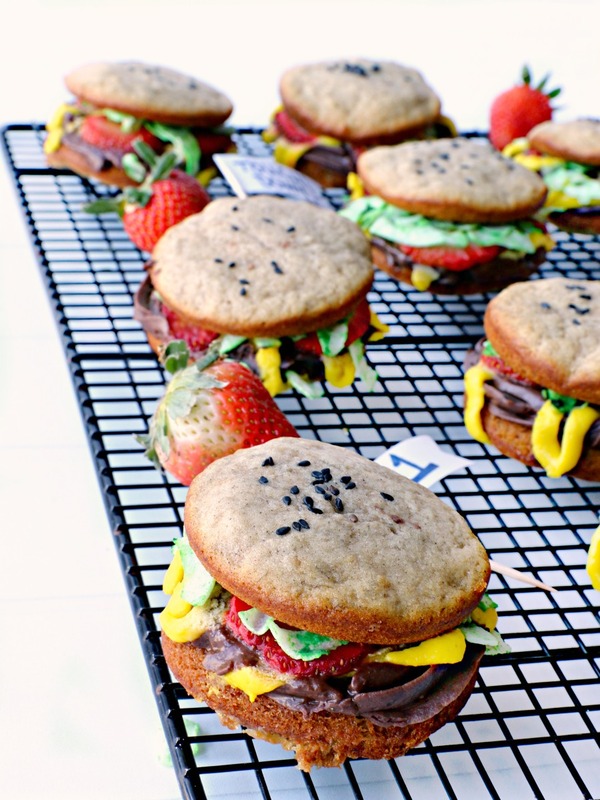 Sprinkle half of the whoopie pies with the seeds or chocolate chips, to make your top bun. Bake 10-12 minutes or until lightly golden. Cool in pan then let cool on a wire rack before assembling. Cream butter for a few minutes in a bowl with an electric mixer. Sift in 3 cups of confectioners sugar and beat on the lowest speed until incorporated and then increase to medium while adding in vanilla, salt and creamer. Let it blend together 2 minutes then scoop out 1/2 cup and set aside. 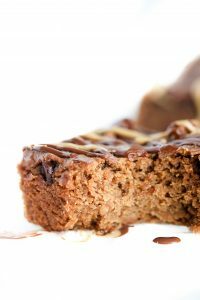 Add cocoa powder to the larger amount in your mixing bowl and whip together another minute to incorporate. Place in a piping bag with a larger round or star tip attached. Add yellow coloring to the smaller amount. If too watery, add in a little more sugar and blend together until it reaches the best consistency. Place in a piping bag with a small round piping tip (or a zip lock bag will work, saling shut and cutting a small corner from the edge. 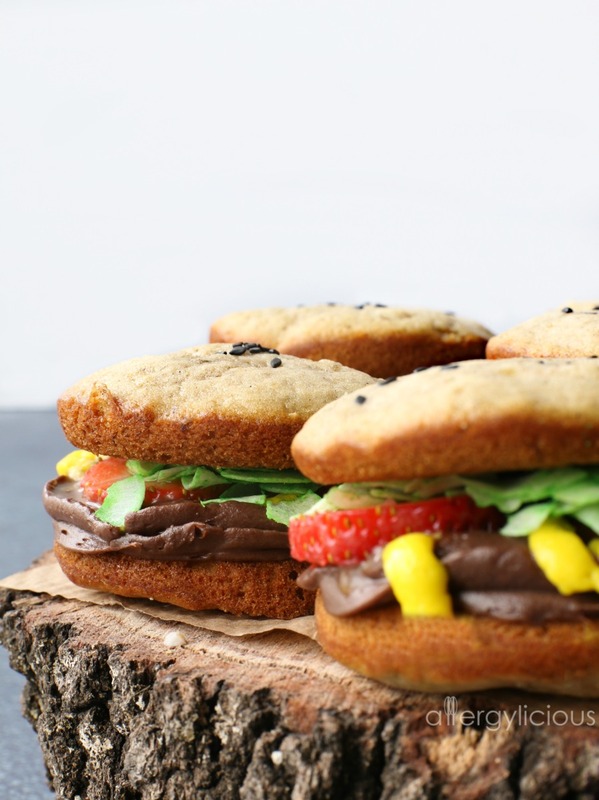 Grab the whoopie pies without seeds or chips and turn upside down. This is your base. Pipe on chocolate frosting, drizzle with “mustard”, layer with sliced strawberries and sprinkle with coconut flakes. Top with seed/chip covered whoopie pie and press down slightly. ENJOY! Be creative when making your patties. Fruit strips and candies can also make fun toppings. Craving More Super Bowl Recipes? Don’t forget to sign up for the Allergylicious newsletter for a fresh serving of content delivered every week to your inbox! Grab a copy of my eBook and stay in touch on Instagram, Facebook, Twitter and Pinterest for all of the latest updates. These are beyond adorable. Then there’s the bonus of allergy friendly so two big hoorays! Thanks Kelly! Food should be fun, especially when you have food allergies. Wow I would have these anytime! Bring on the Valentines Day! Right! Perfect for Valentine’s Day, Super Bowl or Tailgating parties, sports parties, etc. These look SO cute Nicole! I love desserts, and these look like the perfect treat for a kids Valentine’s Day party! These are so adorable! I want to have a party just so I can make them. 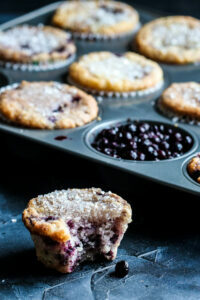 SuperBowl is this weekend…bake away! OMG! These are the cutest things. Where do you come up with such creative ideas? These are so stinkiin’ cute! They would be great to take as snacks for the kids’ sporting events! That’s what I thought and with your little boys, I’m sure they would be a hit. 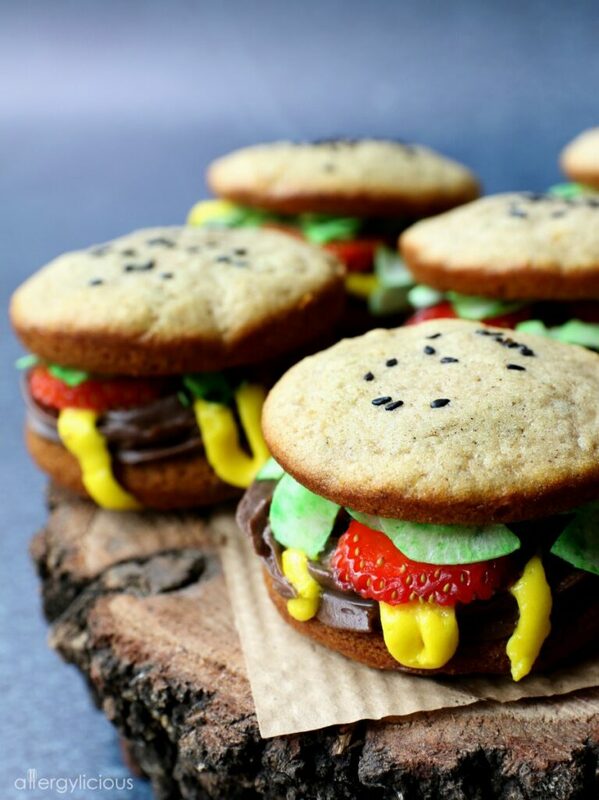 So, if we have whoopie pies that look like burgers, can we have burgers that look like whoopie pies? Just kidding. These look great! Haha! That would be fun. These are so fun! I’m already thinking of all the possibilities for these delicious burger look-a-likes. I think I’m going to surprise my kids with them for April Fools! That’s a super fun idea. I never even thought about April Fool’s Day. I like how you’re thinking on the double patty! And yes, I grew up saying “pop” also…they make fun of me now. You have outdone yourself with this!!! Seriously, so cute. I need to make these ASAP. Thanks Cadry! They were super fun and a big hit. Seriously amazing, Nicole! So creative and totally cute! These will be a huge hit at any party. You’ve outdone yourself with this, Nicole! This is so creative and they look like real burgers. They sound delicious as well. They are a fun little treat for sure. I thought they’d be perfect for tailgating or any sports themed event.